New recipe! 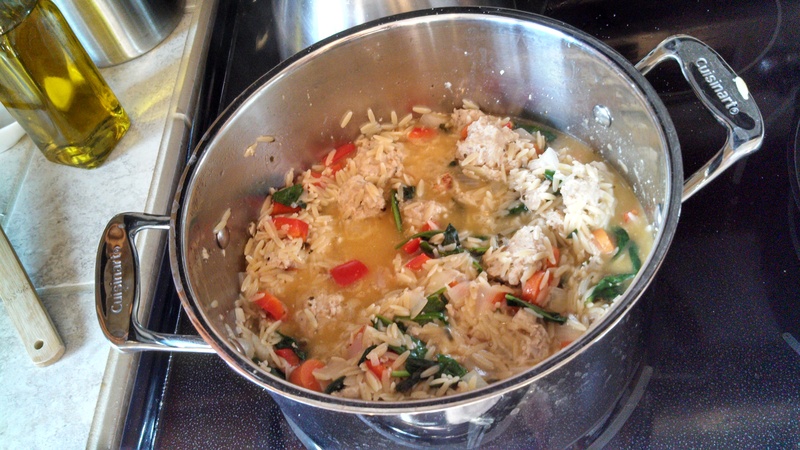 This is currently simmering on my stove… I can’t wait to dig in. Yum! Next, add them to a bowl with oats, 1 egg, milk, salt, pepper, and oregano. Mix well. Add ground chicken and dig in with your hands to mix it up! 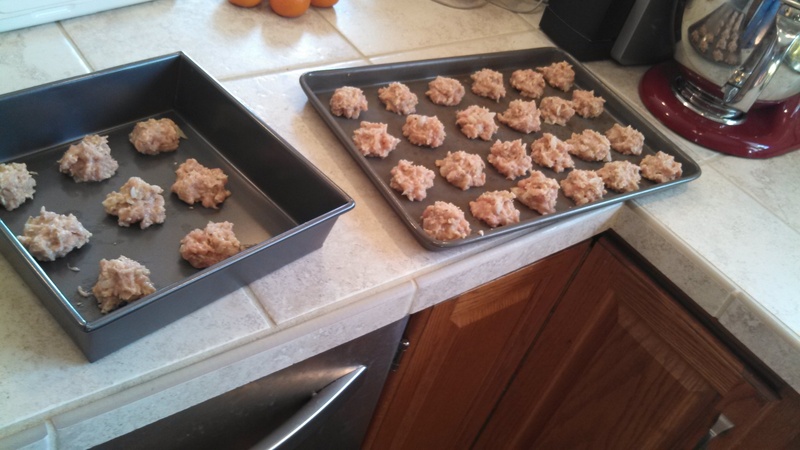 Form small meatballs (1″ or less) and lay out on a cookie sheet. Bake at 350˚ for 20 minutes, checking them at 15. Pull out and set aside. If the next part will take you a while, stick them in the fridge. Next, grab a large stock pot and put 3 cups of chicken broth and a cup of water in it. Add oregano, pepper, and fennel seeds. Bring to a boil and turn temperature to low. 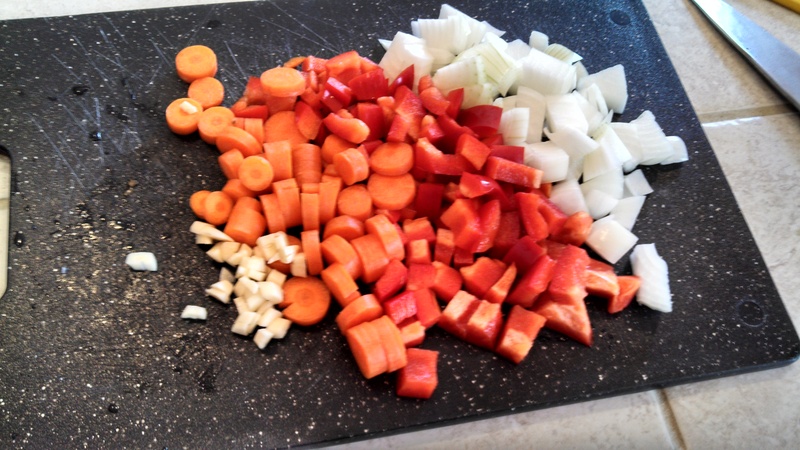 Let simmer while you cut up your veggies! 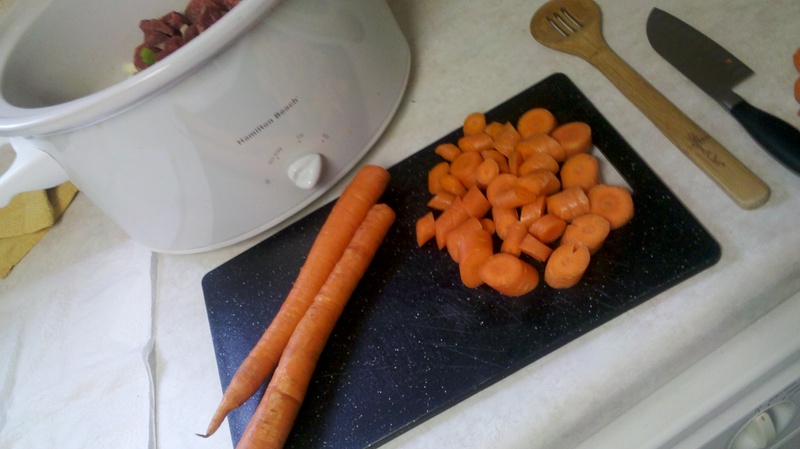 Cut up onion, red pepper, 2 medium carrots, and 2 cloves of garlic. Then add them to the stock. Simmer for 5-10 minutes. Next, add those delicious meatballs along with some chiffonaded basil (fancy word for sliced up finely). Also add about 2 cups of a small pasta. I used orzo. You could also use ditalini or acini di pepe for example. Bring to a boil again (if needed) and let simmer for at least 10 minutes or until pasta is soft. Don’t be afraid to add water or broth as this simmers down. I added 2 additional cups of water. You may need more at higher altitudes. 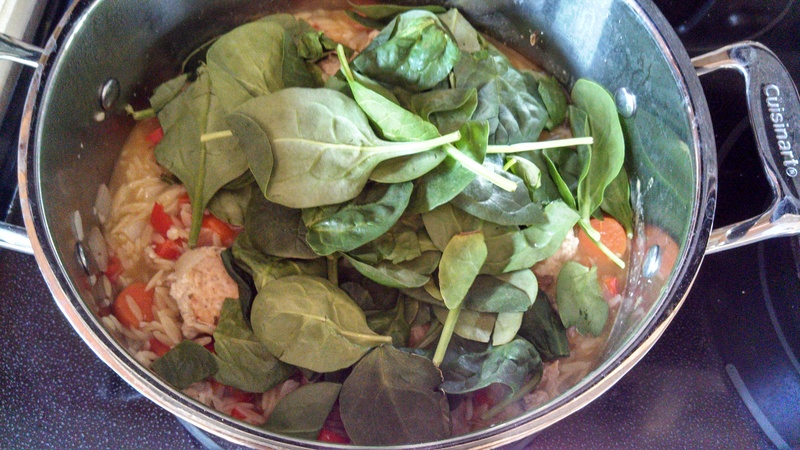 Finally, a few minutes before serving, add a good handful or two of fresh baby spinach to the pot and stir. Season with salt and pepper to taste and then eat up! 1. Finely dice onion and mince garlic. Sauté in a little butter or oil over medium-high heat for 3-4 minutes until soft. Add to a medium-sized mixing bowl. 2. 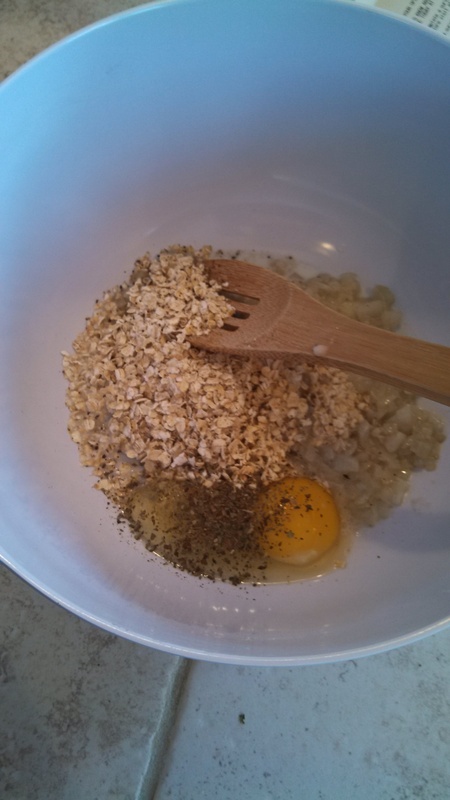 Add oats, egg, milk, salt, pepper, and oregano. Mix well. Add ground chicken and mix well with hands. 3. Form meatballs no larger than 1″ and spread on baking sheet. Bake at 350˚F for 20 minutes, checking them after 15 minutes. 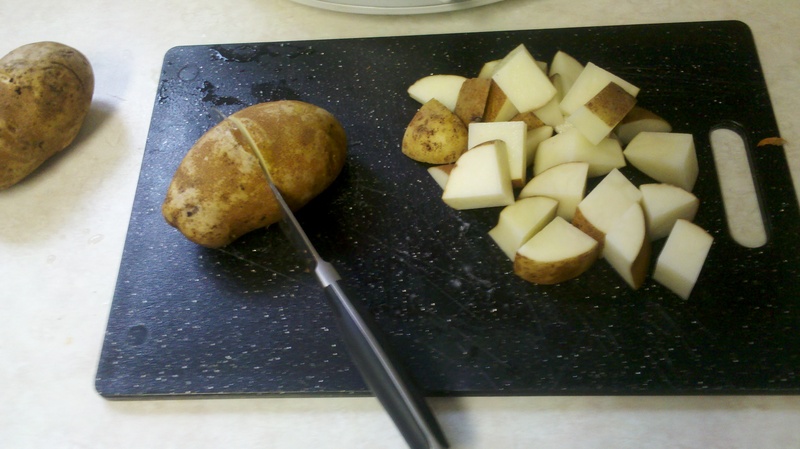 Remove from oven and set aside or refrigerate until needed. 1. 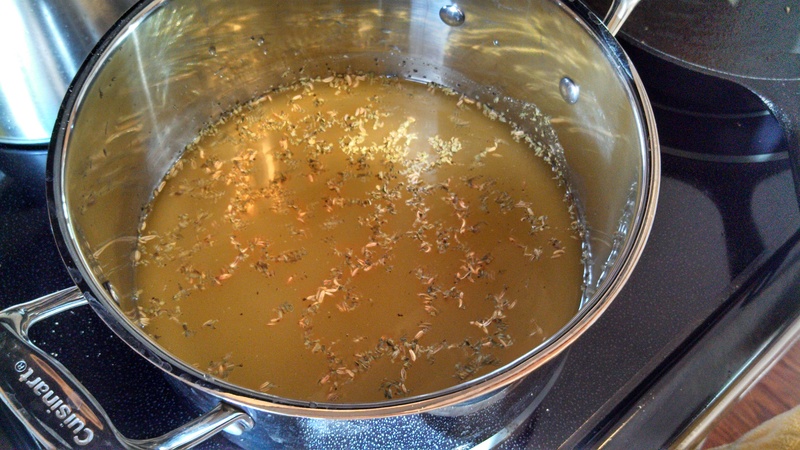 Add broth, water, oregano, pepper, and fennel to a large stock pot and bring to a boil. Reduce temperature to low and simmer while you prepare the vegetables. 2. Largely dice onion, red pepper, carrots, and garlic. 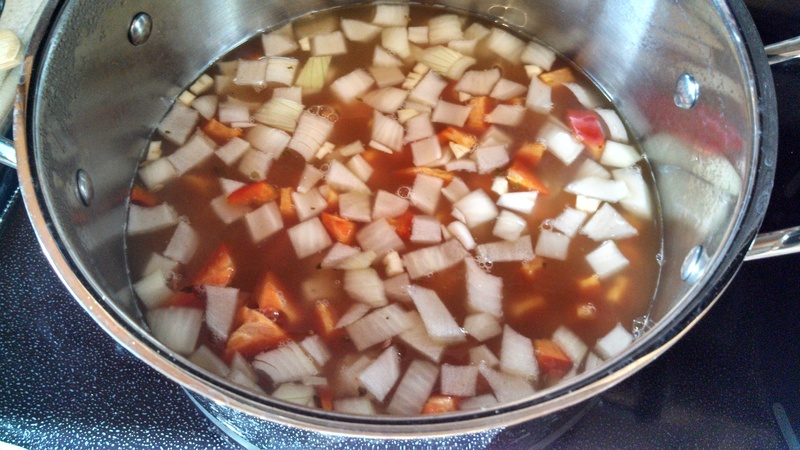 Add to simmering stock and let simmer for 5-10 minutes. 3. Add meatballs and shredded fresh basil. 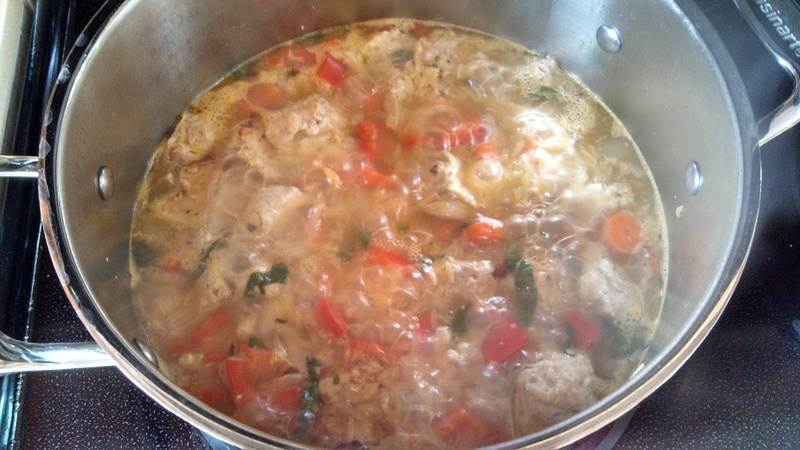 Add pasta and simmer for at least until 10 minutes or until pasta is soft. 4. Add spinach a few minutes before serving and season with salt and pepper to taste. Sorry, I don’t have pics for the whole recipe, but this is a little chicken and tomato something-or-other (the name needs work, admittedly) I whipped up from scratch. I selected an organic, free-range whole frying-chicken from my local supermarket. When I got it home, I removed the gibblets, rinsed the chicken inside and out, and prepared it. I stuffed the chicken with a whole lime (cut in half, rind and all), a handfull of fresh mint leaves, and a few cloves of garlic. Then I rubbed some extra virgin olive oil, salt, pepper, and cayenne pepper into the skin on the top of the chicken. 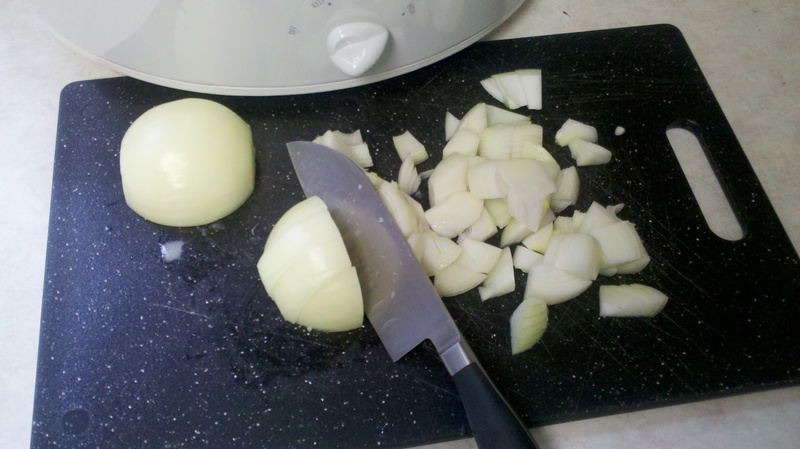 I chopped up two small onions into fourths and placed them in the bottom of a dutch oven as a sort of platform to raise the chicken up on – so that it would not sit in the fat that cooked out of it. I then added a thin layer of chicken stock to the bottom of the pot (not quite touching the bottom of the chicken) for moisture and roasted the chicken uncovered in my oven at 425˚ for an hour and a half until the center of the chicken reached 165˚ and the skin was crispy. I used the rest of the meat tonight. 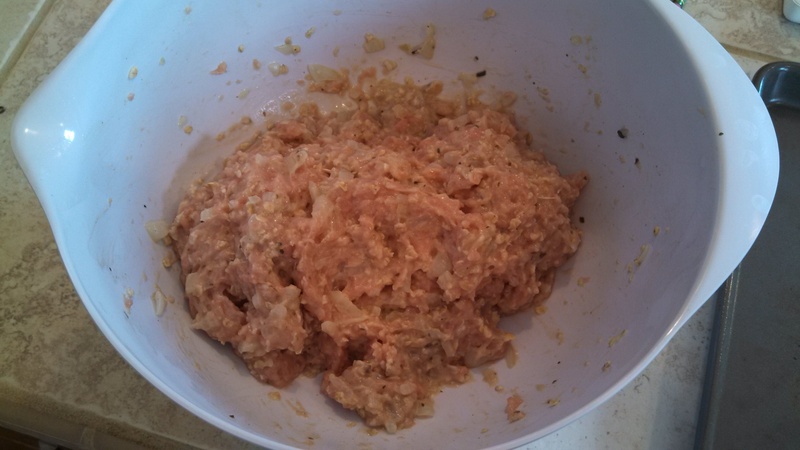 First I minced a small onion and crushed a clove of garlic. 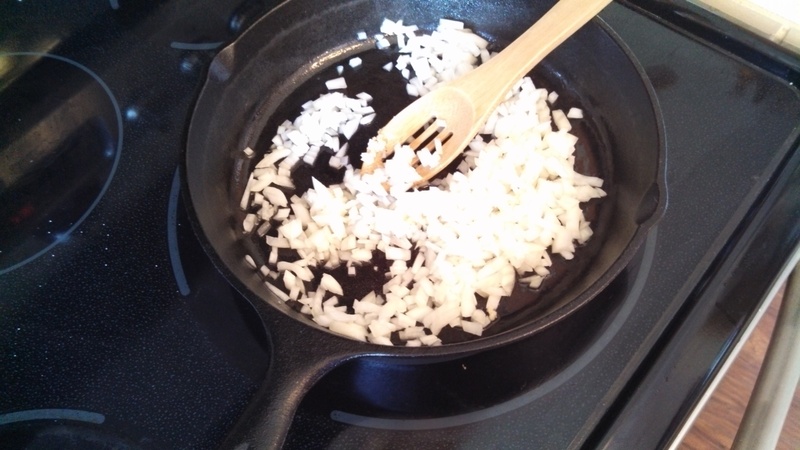 I heated about a tablespoon of ghee (butter is a less-healthy alternative) in an iron skillet over high heat and sauteed the onion and garlic until translucent. I tossed in some cumin (about 1 tsp), a pinch of cayenne pepper, and some oregano (about 1 Tbsp?) and sauteed for a moment to release the aromas. Then I added about 14 oz of diced tomatos (1 good-sized tomato, or 2 small roma tomatos, or one can of diced tomatos) and about 2-3 Tbsp of white wine as well as salt and pepper to taste. 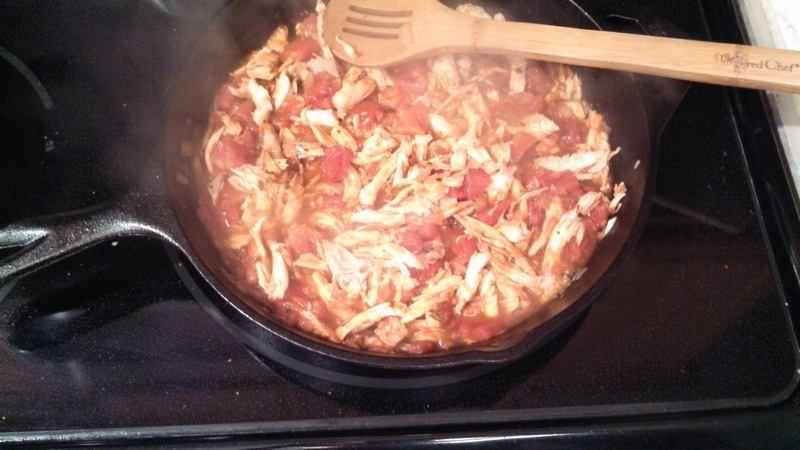 Finally, I added in the rest of the shredded chicken and let simmer about 10 minutes. This is delicious over rice! Start with the chicken. You can use canned chicken if you prefer, but I really like to use roast chicken. Ideally I like to roast my own chicken in the oven or the crock pot, but today I was lazy and just bought a pre-roasted chicken in my supermarket’s deli. Plus, it was about $2 cheaper than the un-cooked variety. And it smelled so good in my car on the way home. 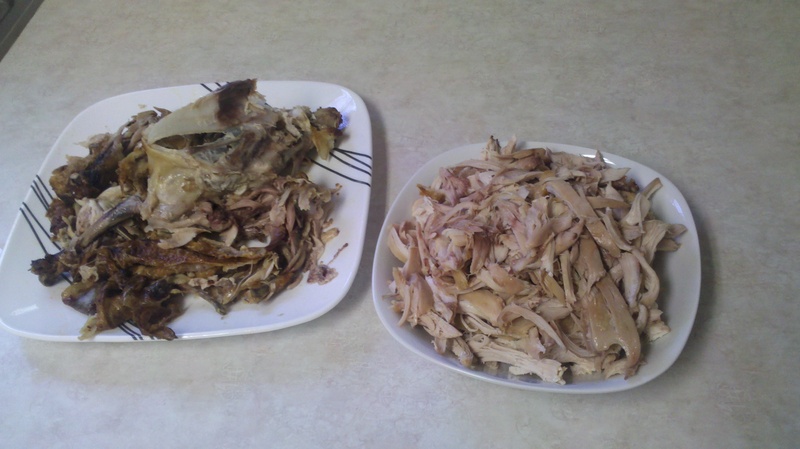 If you are using a whole roast chicken, begin by shredding it. I doubled the recipe today and one whole chicken produced enough meat to do a little more than 4 cups. You can either be fancy and use two forks to pull the pieces of chicken, or you can be lazy like me and put on a couple of disposable gloves and just go at it with your own fingers. I find that easier and quicker. If the chicken is still warm, cover it and stick it in the fridge until it cools before you go on. 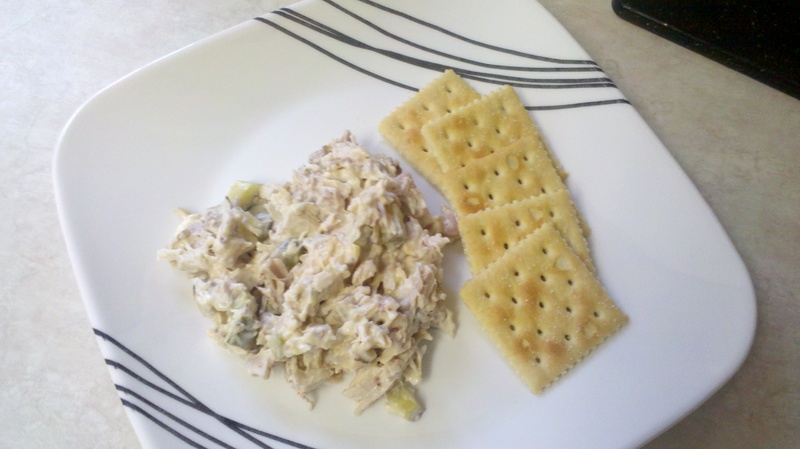 If it is cool, go ahead and chop the shredded chicken into smaller, more chicken-salad-looking pieces. 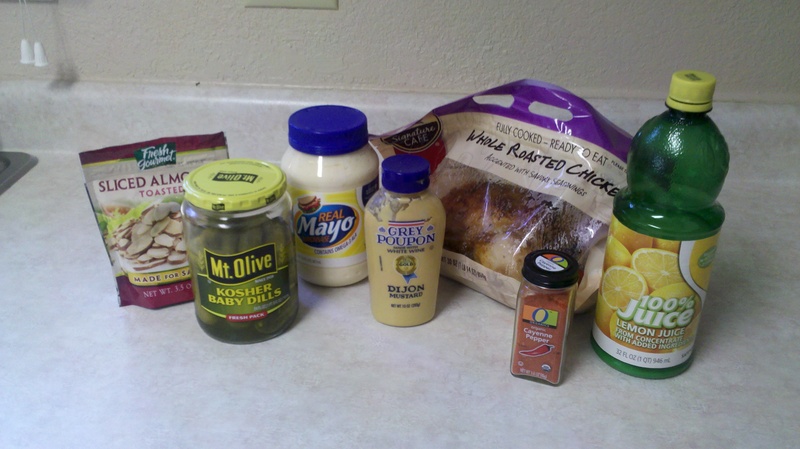 Finally, add the chicken, pickles, almonds, lemon juice, mayo, salt, and pepper to a mixing bowl and mix well until everything is coated. Taste and adjust seasoning as needed. Serve with crackers, or on bread, or just eat it straight with your fork. Then go get seconds! 1. 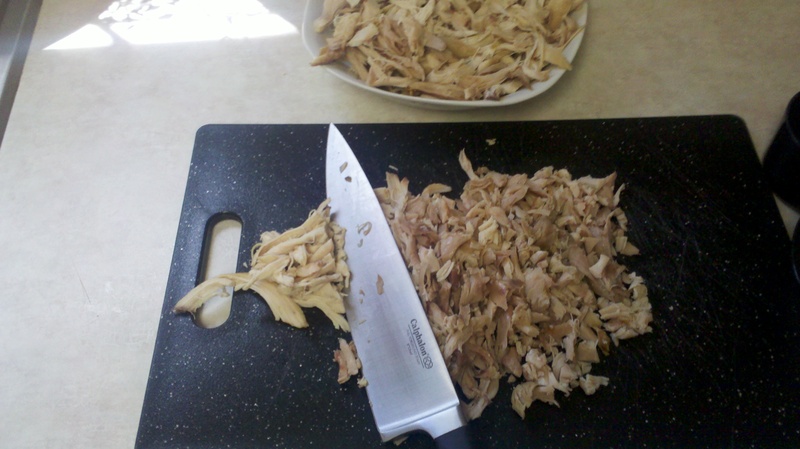 Shred and then chop up 2 cups of cold chicken. 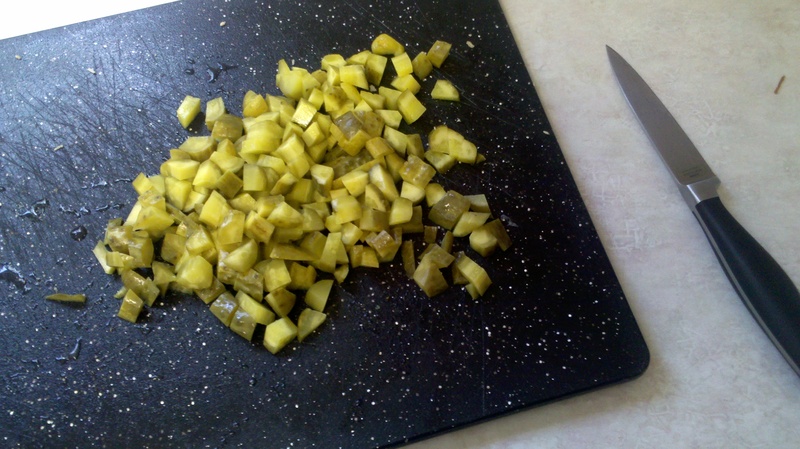 Also chop up the pickles. 2. 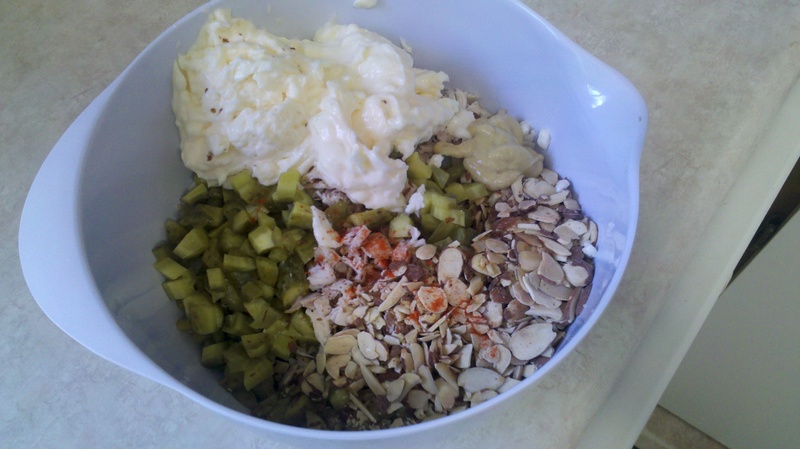 Add all the ingredients to a mixing bowl and mix well until all ingredients are well coated. Taste and adjust seasonings if needed. I love to cook. I mean, I really love to cook. I’m the kind of girl that, if given the choice, I’ll bake bread the old fashioned way before using a bread machine because I genuinely find it fun and relaxing. Or I’ll dig through recipe books to find a complicated foreign cuisine type meal that takes 5 hours and about 7 different pots and pans to make and then try it. Yes, I’ve been told I’m crazy. But I’m ok with that. I realize that stew is not the most exciting, most exotic, or most complicated kind of meal out there. However, it is a good basic recipe to have in your repertoire, and there are dozens of ways to make it. It doesn’t have to be boring old stew. I’m sure this basic recipe is nothing new… I like to find basic recipes and adapt and play with them to make them my own. I’m not rigid in following measurements unless I’m baking. And I’m NEVER rigid in following spices and flavors. 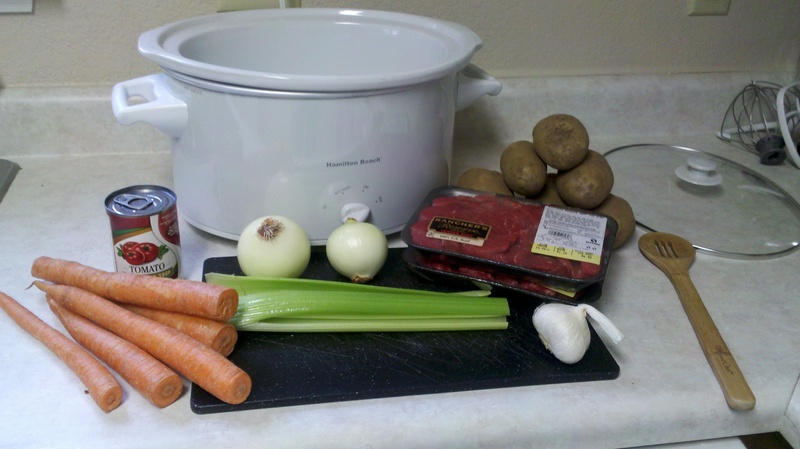 I like to make recipes my own, and this stew recipe is no exception. Here it is, albeit in all of its not-so-exciting simplicity. Now would be the perfect time to saute the onion in a little olive oil over medium to medium-high heat. However, to make a long story short, our oven and rangetop are currently out of commission, so I have to be a little creative. (God willing we’ll get a new oven tomorrow.) So in these pictures, I’m attempting at least to heat up the onion in the crock pot in a little olive oil while I chop up everything else. NOTE: don’t saute the garlic. It burns too easily. 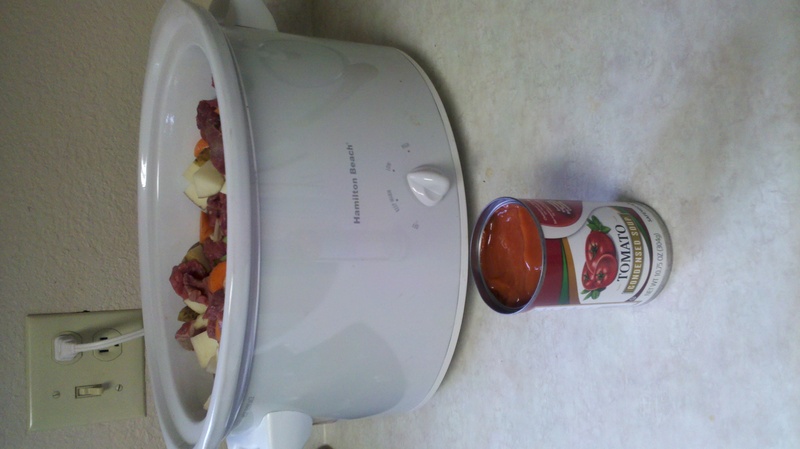 You can just add the garlic straight to the crock pot when you start throwing things in. 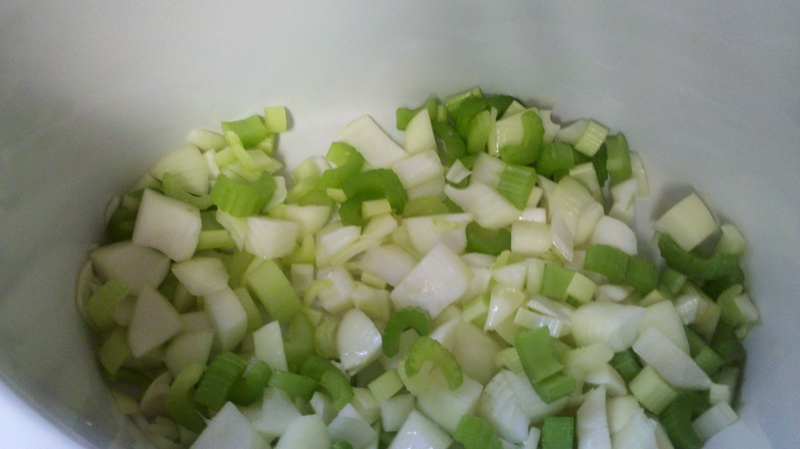 Also chop up the celery at this point and add to the onions to saute until translucent. Ideally, now would be the moment that I would lightly brown the meat in a little olive oil in a skillet over medium-high heat. But again, I’m facing appliance limitations, so I just added it to the crock pot, which works just as well. 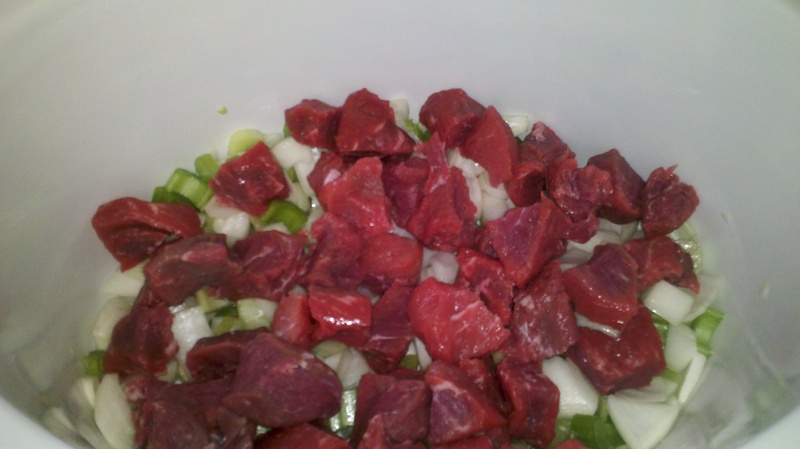 I used stew meat here. The supermarket I buy it at cuts the pieces a little big, so I typically cut each piece in half. I want the stew to be chunky, but I also want it to be edible. Look at those pretty colors! 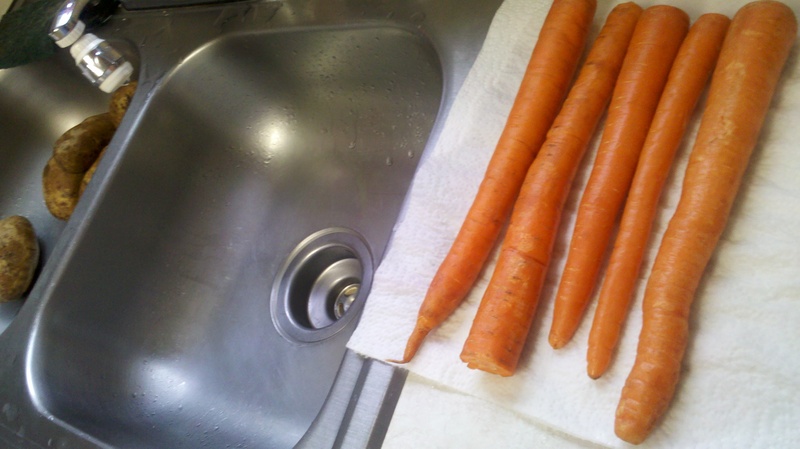 Next, wash the carrots and potatoes really well. Feel free to peel them if you prefer your vegetables to be skinless. I like to leave the skins on because they have so many of the nutrients, so I just make sure to scrub off the dirt really well. Chop them up in good bite-sized chunks and then add them to the pot! Alright, now it’s time for the liquid. I use a condensed tomato soup that, I have to be honest, I’m not entirely happy with. Don’t get me wrong, it tastes really good. But it also has a lot of high fructose corn syrup in it, which is not so good for you. Luckily, unlike their other soups, this particular flavor of Campbell’s does not have MSG. However, I’m still looking for a good condensed tomato without all the corn syrup. Suggestions are welcome! In either case, add the can to the pot, and then a can’s worth of water to the pot. I know it doesn’t look like a lot of liquid, but it is enough. Trust me. The point is good hearty stew, not watery soup. Stir it all up to make sure everything is coated in the liquid really well. Now you can start having fun. For this batch, since it was for someone else, I kept the seasonings fairly simple. Pretty much just salt and pepper. But you can do dozens of different things here depending on what you are in the mood for. My point is, there’s plenty of room to play with flavors! 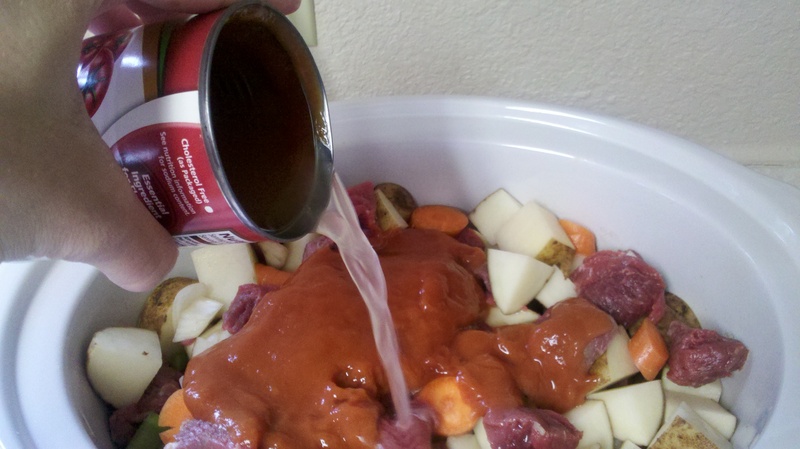 Once you have all your ingredients in the crock pot, cover and cook on low for 7-8 hours or on high 3-4 hours. If you’re nervous about the liquid not being enough (I am cooking at about 6,500 ft after all, so my liquid needs may be a little different than yours), check every couple of hours and add a little more whenever needed. Depending on your flavors, serve this with anything from crusty bread to corn bread to rice! 1. 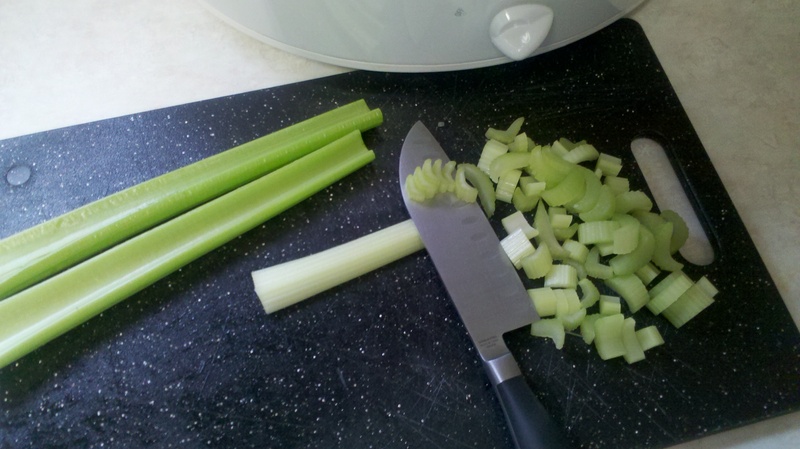 Chop up onion and celery. Saute in olive oil over medium to medium-high heat until translucent, about 5 minutes. Add to crock pot. 2. Lightly brown meat in olive oil over medium-high heat. Add to crock pot. 3. Mince garlic and chop up remaining vegetables in large, but bite-sized, chunks. Add to crock pot. Stir in condensed tomato soup and can-full of water. Salt and pepper to taste. 4. 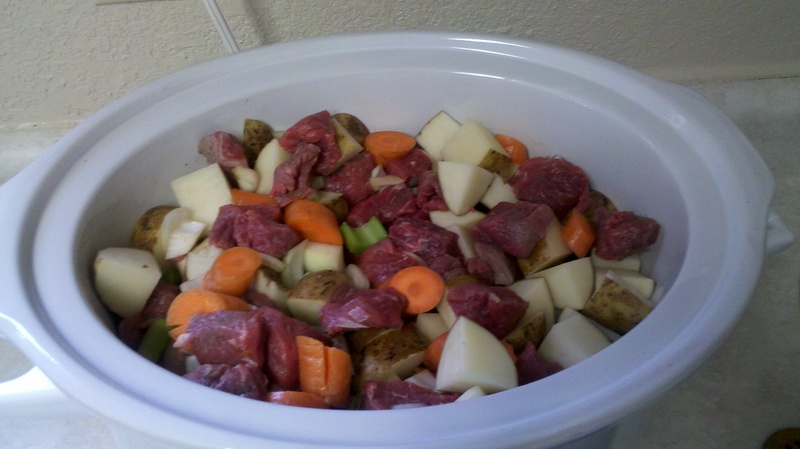 Cook on low 7-8 hours or on high 3-4 hours until meat is done and vegetables are soft.